EPSRC ref EP/F029276/1; Lighting for the classroom of the future: Acceptability of glare; S Fotios & R Parnell, May 2008 to April 2009. Royal Thai Government PhD scholarship. Ramasoot T & Fotios SA, Lighting for the Classrooms of the Future. Electronic classrooms: a new challenge for school lighting guidance, Light & Engineering, 2009; 17(2); 62-70. The learner-centred mode of study, in which students work on a variety of self-paced tasks, means that simple solutions such as dimming the lighting across the whole of a classroom are no longer appropriate. The interactive whiteboard is the most common cause of visual problems with reflections, yet is not addressed in current guidance. One issue is that the whiteboard is observed from a greater range of viewing angles than are personal work stations. There is some evidence to suggest that current guidance for DSE environments, BS EN 12464-1:2002, SLL Lighting Guide 7, are out of date: (i) The current limits on luminaire luminance are un-necessarily restrictive (e.g. 1500 cd/m2 for type I positive polarity display); following improvements in DSE technology, higher luminances are possible without causing disturbance. (ii) Changes in screen technology, such as the use of antiglare coating, have introduced new problems such as haze reflection which are not adequately addressed in guidance. Glossy screens are popular for their high contrast but can suffer from disturbing reflections despite meeting the criteria of BS EN ISO 13406-2:2001 and BS 9241-7:1998. (iii) The guidance does not accommodate rapid changes in DSE technology. 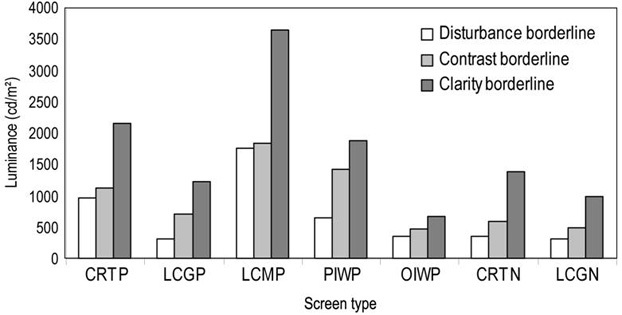 Funding was awarded by the EPSRC to investigate the acceptability of glare on screens: what are acceptable luminances on different screens before these are considered to be disturbing or to affect work. Three tests were carried out. Two of these were subjective assessments, using the adjustment task and the category rating task, to identify the luminance of the disturbance threshold. 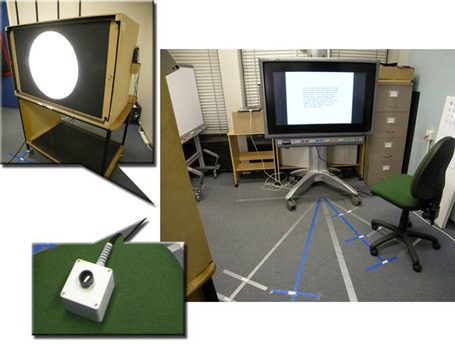 The third test used a reading speed task to provide an objective measure of the effect of screen reflections. The results below, from the adjustment task, show luminances at the disturbance, contrast and clarity borderlines tested with the 10° light source at 15° viewing angle, showing the luminances satisfactory to 95% of participants with each of the seven screens that were tested. It can bee seen that different screens exhibit different luminance thresholds: the matt LCD screen (LCMP) can tolerate high luminaire luminance before the reflection becomes disturbing but the glossy LCD screen (LCGP) can tolerate only a low luminance. Such variation is not accounted for in current guidance as to limits of luminaire luminance. 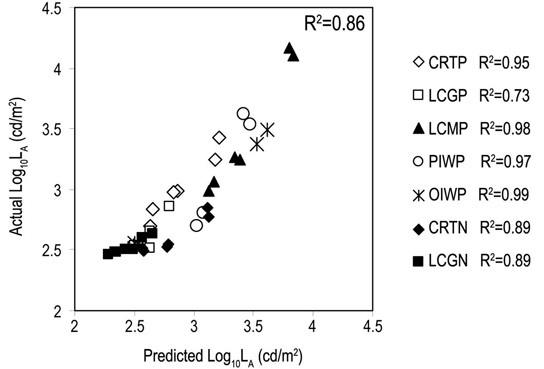 This model can explain up to 86% of the variance in Log10LA.